Florida Lakes are different than most people think. Most people have a mental image of a Florida lake that is far different from reality. Many Florida lakes are shallow, weedy and contain dark or stained water. Our larger lakes, such as the Harris and Kissimmee Chains, are interconnected highways to the ocean that keep Florida from flooding during the rainy season. The water in these large lakes is mostly dark with visibility limited to a few feet. Most of our clear water lakes are spring-fed which makes them great for swimming, but most spring-fed lakes are not big enough for water skiing unless you enjoy skiing around in circles. There are some excellent waterskiing lakes in Florida, but lakefront land on these lakes commands a high premium because they are rare and very desirable. In recent years, developers have begun to advertise man made canals and rock pits as lakes to lure waterfront home buyers. How do water level fluctuations affect the value of lakefront property? Florida lakes depend heavily upon rain fall to maintain water levels. Rain cycles in Florida run in 5-10 year cycles of high and low water. In some areas of Central Florida over development has caused some lakes to lose up to 10 feet of water. The Harris Chain has not been substantially affected with normal fluctuations nearing 2-3 feet from year to year. Canals are a different issue. It is important to know the full length depth of a canal before you consider buying a specific canal front home or lot because you might find your boat hanging from your boat house for well over a year during a drought. You can not obtain this information from your average real estate agent, you must deal with someone who has first hand experience of a canal's depth during a low water period. We specialize in Harris Chain lakefront property and have first-hand knowledge of the canal depths in all rain cycles. What is a Florida Lake Conservation Zone and how will it affect my property? In Florida, property owners can own the shoreline, but the lake's waters are considered a public resource. Water quality is a very sensitive issue in Florida and much has been done to improve the water quality of our lakes. The Government Agency that controls water quality issues in Central Florida is the St. Johns Water Management District. The District has many responsibilities, among them are defining policies pertaining to lake shorelines and docks. A conservation area is an area of land, usually adjacent to a body of water, which has specific regulations against clearing and/or pruning of trees and undergrowth. It is important to know what conservation regulations apply to a particular lakefront property or you may find that you may not be able to access or even view the lake from the property you just purchased as lakefront. Water color and quality can vary widely in Florida lakes. Small spring-fed lakes in Central Florida normally contain the clearest water with visibility commonly exceeding 6 feet. Many Florida lakes are found in Cypress marshes and are stained black with the tannin from the trees. This does not necessarily mean the water is dirty or polluted. The dark color comes from the cypress trees and can be especially nice for swimming because these lakes tend to have cooler water temperatures in the summer due to low sun penetration. Algae blooms can also change the water color of a lake to green or brown. Ongoing studies are being conducted to determine if lake algae is harmful to humans. Harris Chain water quality has substantially improved over the last 10 years. Hundreds of millions of dollars have been invested to buy out old farms and build storm water retention ponds. The Harris Chain Restoration Council website contains more information on this continuing effort. Florida lakes are publicly owned and regulated by State Water Authorities. In most cases, access to Florida lakes is open to the public unless private parties own all the land surrounding the lake and there is no inlet to the lake from any outside public waterway. For this reason, water skiing, fishing and boating are popular pastimes in Florida. 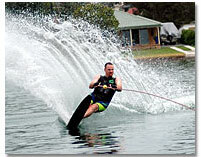 Water skiing can be regulated by boat motor restrictions enacted by water authorities. It is best to keep water skiing activities to the larger public waterways to avoid causing wake damage or risk being involved with an irate fisherman or shoreline property owner. Cruising and fishing are also popular water activities in Florida. For example, the Harris Chain has numerous waterfront restaurants and miles of cruising waters. The Chain is also known for outstanding bass and crappie fishing. Public ramps are numerous allowing the lakes to be enjoyed by everyone. Is swimming safe in Florida lakes? All natural Florida lakes contain alligators and snakes. In addition, the majority of natural Florida lakes have dark or stained water limiting visibility. Alligators and snakes depend upon the ability to ambush prey to survive. Because of this and because they generally wish to avoid human contact, an attack on a water skier while skiing has never been reported. You are far more likely to injure yourself in some other way than to be eaten by an alligator while water skiing. Swimming in a Florida lake is generally safe, but there definitely have been people attacked and killed by alligators in Florida. Alligators are very fond of eating small animals like dogs and cats. Small children should not swim alone or be left unattended on the shore of a large Florida lake. Never swim in a Florida lake at night and never clean fish on the shoreline. Use common sense and you will enjoy the lake without putting you or your family members in danger. What tests should be done before buying Florida lake property. There are some very important determinations you need to make before purchasing a particular lakefront property. The ability to have a boat dock as discussed above is one of them. Another is determining the elevation and location of the flood zone, which involves a survey. You also need to know if the lot location where you wish to build your home is permitted or advisable. Lake setbacks have been established and the use of septic tanks is now strictly controlled. Penetration tests are performed to ascertain the stability of the soil under your home and percolation tests are used to determine drainage rates. Your Realtor needs to allow time for these tests to be performed and contingencies need to be placed in your contract to allow you to break the contract or renegotiate without penalty if you find a problem. How do you locate hard to find lakefront property? Finding the right lakefront property sometimes involves much more than looking through real estate ads. Homes may be advertised as being lakefront when they are actually blocks from the lake. For example, many people are confused by the term "Lake Access". Any home listed as "Lake Access" is most certainly not actually on the lake. Lake Access means that the community shares a lake resource such as a dock, boat ramp or small community strip of land on the lake. Lakefront property owners are aware that their property is valuable and many of the more desirable properties are sold by individuals without being offered to the general public. For this reason, it is important to choose an agent with local knowledge and personal contacts with lakefront property owners. Ask your Realtor if he or she knows of any lakefront properties that are not listed. 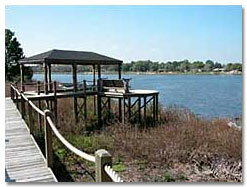 Some Realtors will canvas a lake looking for sellers and solicit a sale on your behalf. This is a paid service, which is usually credited if a sale is made.